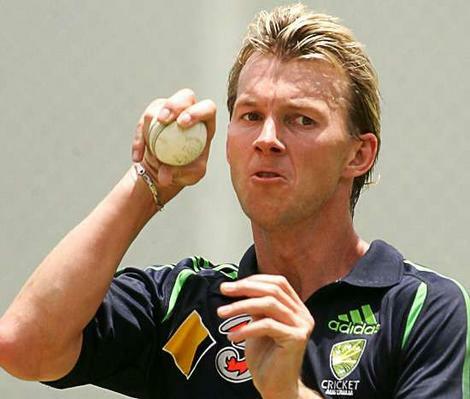 Johannesburg, Feb 07 - Former Australia paceman Brett Lee is hoping that the pitches during the World Cup would be their traditional Australian pitches with real bouncy and fast wickets, and has claimed that his country's bowling is very balanced for the tournament. Speculations are rife that the Australian pitches for the February 14-March 29 tournament might be better suited to batting after a record number of runs were scored during India's recent four-Test series Down Under. Sydney, Nov 17 : Former Australian Test cricketer, who welcomed Prime Minister Narendra Modi at the Allphones Arena in Olympic Park here today, said that India has been close to his heart. "I would like to welcome Prime Minister of India, Namaste, welcome to Australia," Lee said. "I first fell in love with India in 1994. It is very close to my heart, beautiful people," he added. The Prime Minister, who arrived at the event to a rousing welcome, shook hands with former Indian cricketer Javagal Srinath and Australian umpire Simon Taufel prior to his address to the Indian Diaspora. New Delhi, June 20 : Former Australian pacer Brett Lee launched a signature t-shirt for his Foundation, Mewsic, to mark the occasion of World Music Day, which will be celebrated Friday. Available online, the t-shirt has cricketer's personal signature and the Mewsic Foundation mascot, a guitar playing cat called Binga, and is a collector’s item. “June 21st has been celebrated across many countries as World Music Day since 1982. Given my passion for music and the focus of my foundation, I felt we should do something to mark the day, celebrate music and generate awareness for our work,” Lee said in a statement. Sydney, Jan 2 : Former Australian fast bowler Brett Lee has escaped reprimand for condemning Cricket New South Wales (CNSW) boss David Gilbert after charges against him were dropped on Wednesday. Instead, CNSW has invited Lee to join a sub-committee of its board to address issues as to the future direction of cricket in NSW, according to a statement by the board. New Delhi, June 17 : Australian fast bowler Brett Lee is set to walk the ramp for designer Rajesh Pratap Singh at the International Indian Film Academy (IIFA) weekend to be held June 23-25 in Toronto, Canada. The organisers announced that designers Sabyasachi Mukherjee, Rajesh Pratap Singh and Vikram Phadnis will showcase their respective collections at the IIFA Rocks, a fashion extravaganza high on style and music. London, May 29 : Cricketer Brett Lee, who does the back-up vocals and plays bass for the band ‘White Shoe Theory’, is all set to launch music career in Australia. He has revealed that the band would be launching its first local singles. “We''re going to launch our single shortly, so it''s all happening,” the Telegraph quoted Lee, who had returned to Australia this weekend for a six-week stay as saying. “We''re working out which one we want to release first, he added. London, May 29 : Cricketer Brett Lee, who is single and is looking for love, has been linked with several fine-looking Bollywood actresses, including Priyanka Chopra and Preity Zinta, in the recent weeks. Lee, who had split from wife Liz Kemp in 2008, admitted that he is single but said his focus is on his son. New Delhi, May 28 : Bollywood actress Preity Zinta seems to have got quite bored with her constant link-up to Australian fast bowler Brett Lee, who now plays for her Indian Premier League team Kings XI Punjab. The actress, who was earlier dating industrialist Ness Wadia, took to micro-blogging site Twitter to tell her friends and fans that she is just friends with Lee. "I think being romantically linked to Brett every year is outdated and stale news now! So sorry to say folks NO NEWS here! FRIENDS yeesss (sic)," posted Preity. Australian cricketer Brett Lee has announced the decision to quit test cricket on Wednesday. The announcement came after the player suffered many injuries during recent times. "This is not the end of me. It's a cricket choice and it's a lifestyle choice," Lee said. He further said "To me, Test cricket is my favourite part of the game, wearing the baggy green cap, but if I'm going to keep playing cricket for another few years, something had to give." Brett lee, one of the best bowlers that the cricketing history has seen, has decided to quit test cricket forever. He made this decision after talking to one of the best all-rounder's of all time England's Andrew Flintoff. Brett Lee, whose career has been full of ups and downs mainly because of his injury problems, will make an official announcement this week, during a press conference. The 33 year old veteran fast bowler has been quite injury prone throughout his career, and is currently nursing one. Andrew Flintoff who earlier retired from Test cricket in order to prolong his career had a chat with this veteran bowler who has been a part of 2 time World cup winning squad. Lee who played his last Test in December 2008 has 310 wickets. Melbourne, Nov 21 : Former Test quick bowler Rodney Hogg feels Brett Lee should retire from Test cricket to spearhead Australia's bowling attack in the 2011 World Cup. Lee's international future is at the crossroads, with the 76-Test veteran taking time out to ponder his future after succumbing to an elbow injury. Despite his litany of setbacks, Lee is not convinced his illustrious Test career, 310 wickets at 30.82, is over. But Hogg says Lee, 33, should put his energies into the game's shorter version. "Brett Lee should just retire from Test cricket," Hogg was quoted as saying in Herald Sun. Melbourne, Nov 17 : Australian fast bowler Brett Lee's Test career received a severe jolt as he is likely to undergo a surgery on his elbow and would be out of the game for eight weeks. The Age reported that if the speedster, who has claimed 310 wickets from 78 Tests, undergoes a surgery then it would put a big question mark on his career. Lee's manager Neil Maxwell had already disclosed to the daily that the fast bowler was contemplating retirement from the long format. Sydney, Nov 17 : Australian fast bowler Brett Lee’s Test career could be in danger of ending sooner than later after it was reported that he is likely to require a surgery to remove a bone spur from his elbow that would sideline him for at least two months. The 33-year-old veteran of 76 Test matches and 310 Test wickets could now be forced to make a decision on his future in the game, as he has been struggling with the injury for the past one year. Lee is exploring alternatives to surgery, but conceded that it might be the only option. Sydney, Nov 16 : Australian fast bowler Brett Lee is unlikely to be considered for the first Test against West Indies starting November 26 after failing to recover from an elbow injury. Lee aggravated his troublesome right elbow in New South Wales (NSW)''s Ford Ranger Cup loss to the Tigers on Sunday, robbing him of the chance to impress national selectors ahead of the first Test. Lee has also been left out of the NSW line-up for the Sheffield Shield match against Tasmania starting Tuesday. Melbourne, Nov 4 : Australian fast bowler Brett Lee, who flew back home midway from the ODI series against India due an elbow injury, will resume bowling next week. Cricket Australia (CA) said Wednesday that both Lee and wicketkeeper Tim Paine, who fractured his finger, underwent check-ups here and nothing serious was found. Melbourne, Nov 2 : Australian skipper Ricky Ponting has backed Brett Lee’s bid to beat his injury and come back into Test contention, but the fast bowler’s friends Damien Fleming and Michael Kasprowicz have warned the veteran’s future should be decided purely on performance and not on reputation. Australia will play the Test series opener against the West Indies at the Gabba starting on November 26. New Delhi, Oct 30 : Australian fast bowler Brett Lee and all-rounder James Hopes have been ruled out of Saturday's one-day international against India at the Ferozeshah Kotla. Lee, who suffered an elbow injury in the opening ODI at Vadodara, missed the next match in Nagpur while Hopes too had to sit out of the second ODI with a hamstring injury. Australian captain Ricky Ponting said Friday the duo would take a couple of days to be fully fit for international action. Brett Lee has hit the headlines without doing much of note in the ongoing series with hosts India. After complaining of elbow pain in the first game, he skipped the second and is not sure of playing the third one in New Delhi. Talking at a programme to promote an Australian university on Thursday, the fast bowler said he'd take a call on Friday. “I think I'll know a lot more tomorrow at training. I'm not going to make a call today to say whether I'll be available for the weekend or not. I'm hoping to be, but I'll know a lot more at training,” he said. He blamed the crammed schedule for his injury. Sydney, Oct 27 : Australian pacer Brett Lee's mystery elbow injury ahead of the second one-dayer against India threatens to derail his Test comeback hopes. Lee (elbow strain) along with paceman Mitchell Johnson (rolled ankle) is in serious doubt for Wednesday's clash in Nagpur, while all-rounder James Hopes has a hamstring tear. The timing could not be worse for veteran Lee - trying to convince selectors of his durability as he strives to again be Australia's Test spearhead this summer and take 400 Test and one-day wickets. Sydney, Oct 27 : Australian all-rounder Moises Henriques will fly to India as cover for injured pacers Brett Lee and Mitchell Johnson. Lee (elbow) and Johnson (ankle) are both to be rested from Australia's second one-day international against India in Nagpur Wednesday. Their injuries are considered relatively minor and they're expected to resume in the seven-match series. Henriques' call is reward for a sterling performance in New South Wales Blues' title triumph at the inaugural Twenty20 Champions League in India which ended last weekend.